Invented by J. Monod, and independently by A. Novick and L. Szilard, in 1950, the chemostat is both a micro-organism culturing device and an abstracted ecosystem managed by a controlled nutrient flow. This book studies mathematical models of single species growth as well as competition models of multiple species by integrating recent work in theoretical ecology and population dynamics. Through a modeling approach, the hypotheses and conclusions drawn from the main mathematical results are analyzed and interpreted from a critical perspective. A large emphasis is placed on numerical simulations of which prudent use is advocated. 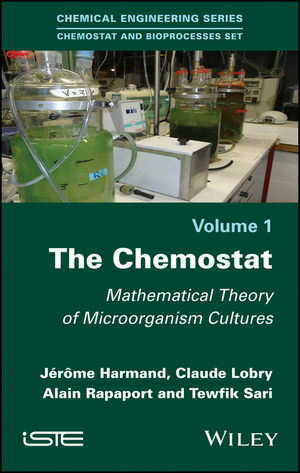 The Chemostat is aimed at readers possessing degree-level mathematical knowledge and includes a detailed appendix of differential equations relating to specific notions and results used throughout this book. Claude Lobry, University of Bordeaux and University of Nice, France. 2. The Growth of a Single Species. 4. Competition: the Density-Dependent Model.